When Sir John Tavener died almost exactly a year ago in November of 2013, the London Evening Standard headline read, “John Tavener: Farewell to Classical Music’s Cult Hero.” Probably the only classical composer to have been promoted by the Beatles, he was indeed both a brilliant classical composer and something of a cult hero. Ringo Starr and John Lennon were impressed by his cantata The Whale, and in 1970 it was released on their Apple label. The cantata’s text is the story of Jonah and includes instructions for snorting and yawning sounds by the chorus, to create the effect of whale sounds. Tavener achieved fame, fortune and a connection to the British royal family when his Song for Athene, a song composed after the death of a young Greek girl who was a family friend, was played at the funeral of Princess Diana. He was made a knight in 2000 just a few years later. His work ranged ever more widely. He composed Veil of the Temple in 2003 as an all night vigil. It was scored for four choirs, several orchestras and soloists, and lasted seven full hours. His Prayer of the Heart was written and performed for pop performer Björk, and in 2007, he wrote a piece called The Beautiful Names, the text of which is the 99 names of God in the Muslim tradition. The composer had been captivated by music from the age of three and eschewed formal theory teaching for improvisation. Tavener was a man of contrasts, simultaneously fascinated with the intensity and asceticism of the Russian and Greek Orthodox traditions, yet flamboyantly dressed and delighting in good food and fast cars. A journalist once described him as “a mystic who drives a Rolls Royce.” Devoted – and even perhaps disturbingly attached – to his charismatic mother, he was not able to sustain a relationship with a woman and have a family until after his mother died when he was close to 50 years old. His most important collaborator was a mother figure, a Russian Orthodox nun named Mother Thekla. From the 1980s on, she either wrote or adapted nearly all of his texts until late in his life when – almost certainly as the result of tension between his wife Maryanna and Mother Thekla – he broke off their partnership. Opening the heart seems an apt description of the way one might receive a performance of his song “The Lamb.” Tavener composed this utterly simple song in one day in 1982 for his then three-year-old nephew Simon. In The Music of Silence, Tavener writes “The Lamb’ came to me spontaneously and complete. I read Blake’s poem ‘The Lamb’ from the Songs of Innocence and as soon as I read it, the music was there…. Also, symbolism in the use of chords appears in The Lamb – there’s a joy/sorrow chord in it (Tavener refers here to the chord A-C-G-B) , on the word ‘lamb’ , which I was to use many times later.” For Cecilia’s Music Director, Nicholas White, hearing the second ever performance of this piece at age 15 was compelling: he was hearing something “radically different from any other carol” he’d heard before. It is hard to consider the constant refrain of homage to the mother Mary without thinking of Tavener’s powerful attachment to his own mother and his sense that she was crucial to his development as a composer. Tavener wrote about his piece: “I have set both familiar and less well known elements and linked them with an expanding and contracting phrase Ex Maria Virgine. This refers to Mary, Mother of God, and should be sung with great radiance and femininity.” The cycle uses the words of conventional English carols like “Ding! Dong! merrily on high” and texts from Greek and Islamic sources in a piece that challenges the listener. There is at once a sense of disconnection; is this medieval England or ancient Byzantium? Is that Latin or Aramaic? and then unity. Somehow the dissonant and melodic sections, the different languages, the angry words about the “The Empress of Hell” and the “lulla lulla” of the lullaby to rock the infant Jesu, all come together, united by the repetition at the end of each of the ten sections with the “expanding and contracting” phrase Ex Maria Virgine. Perhaps in the later years of his life, some of the conflicts within this compelling, and passionate composer were also coming together. He had held onto his early fascination with Russian tradition, explored eastern religious and mystical tradition, focused on sacred texts and eschewed much of modern music, but he returned to Beethoven, Handel and others, and in his very last years set sonnets of Shakespeare to music. His funeral was in the Anglican Cathedral of Winchester but presided over by a senior Orthodox bishop. On December 5th and December 7th, The Boston Cecilia will excitedly undertake the complexity of the brilliant and enigmatic John Tavener as we celebrate both his legacy and the Christmas season. In 1982, when I was 15 years old, I first heard The Lamb by John Tavener. This second-ever performance of the carol was included in the Christmas Eve radio broadcast of Nine Lessons and Carols, live from King’s College, Cambridge. A much smaller audience had heard the very first performance of this newly-composed work at Winchester Cathedral two days earlier. I remember feeling that I had just experienced something radically different from any other carol I had heard before. The truth was that several million listeners across the world had just had the same experience, and the reputation of the composer, in the space of three minutes, had been propelled to a whole new level of renown. The music was stark, yet gentle; dissonant, yet comforting; simple, yet haunting. I think I made my decision shortly after that to pursue an organ scholarship at Cambridge University, which had me living, literally, in the shadow of King’s College Chapel for the three years of my undergraduate career. As it happens, I had followed in the footsteps of one of Tavener’s school friends and fellow composers, John Rutter, who had studied music at Clare College twenty years before me. When John Tavener died, just a little over a year ago, I began thinking of how we might pay tribute to him with The Boston Cecilia. I had been aware of a series of commissions that Tavener had written around 2005, which resulted in a sequence of carols entitled Ex Maria Virgine. 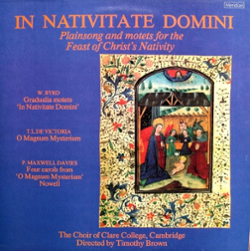 This sequence had been recorded by Tim Brown and the Choir of Clare College, Cambridge in 2008. As I listened to the recording, made in the grand surroundings of the Chapel of St. John’s College, Cambridge, I decided that it would provide the ideal challenge for The Boston Cecilia and a great way of celebrating the life of John Tavener at our December concerts. The luxurious acoustics of The Church of the Advent and All Saints, Brookline, along with their fine organs, would create an ideal vehicle for this eccentric music. Also on my mind at this time was Richard Rodney Bennett, whose music had captured my interest at a very early age when I learned several of his compositions for piano. Later on in life, we ended up as neighbors on the Upper West Side of Manhattan, and I was fortunate in getting to know Richard, talking about his film scores, and discussing choral music, occasionally over dinner at a local restaurant. In the year 2000 I had conducted the New York premiere of his large-scale work for choir and organ, The Glory and the Dream, and the organist for the performance was none other than Barbara Bruns, for whom Richard had the highest praise. Richard died on Christmas Eve of 2012. As I had long been familiar with his Christmas carols, I instantly thought that these would provide a perfect complement to Tavener’s works, so I went about assembling the program that will be performed by The Boston Cecilia on December 5th and 7th, 2014. According to Tavener, The Lamb was written in an afternoon and is built on a simple melodic idea and its inversion. Tavener’s tempo direction for the piece is explicit and simple: “With extreme tenderness – flexible – always guided by the words.” For those of us who are devoted to the art of choral singing, there is surely no better way of conducting ourselves.